Valladolid has about 300,000 people and is surprisingly well communicated. You can take a 55-minute train or a two-hour bus from Madrid to the city center and RyanAir, Vueling and Iberia have regular flights from Barcelona and Malaga. If you do take the train, a good place to start your day in Valladolid is the new Estacion Gourmet which is a fantastic traditional market, with cheese, wine, jamon and even the only Spanish branch of Madrid’s historic San Gines Chocolateria. From the train station, you can cut through the Campo Grande, a lovely city park with a lake, crazy impressive playground equipment including a life-size pirate ship, and plenty of peacocks roaming around. Out the other end, you’ll find yourself in Calle Santiago and the shopping district. That ends with the impressive (especially at Christmas!) Plaza Mayor, from which Madrid’s Plaza Mayor is modeled after. Here is actually a nice and reasonably priced place for a relaxing cup of cafe con leche. On all the streets webbing out from Plaza Mayor you will find some of the best and cheapest places to eat and drink in all of Spain. Valladolid is home to the annual International Tapas Contest and with good reason. Try Pincho de Oro “Obama en La Casa Blanca” (a truffled egg dish) or the “Bread Bag” (a tiny calamari sandwich, in an edible wrapper) at Los Zagales. Then move onto Villa Paramesa Tapas for the 2014 Golden Tapa, a Japanese-inspired ceviche of sardines with seaweed and black garlic. Then you simply must try the lechazo (suckling lamb) meatballs at Restaurante Zamora. Each of these award-winning, elaborate tapas can be paired with a fantastic cup of wine or beer for less than five euros total. The Province of Valladolid uniquely boasts four Designations of Origin: Ribera del Duero and Toro for red, Cigales for rose, and Rueda for white. At many of the local “old man bars,” you can get this wine for only about a euro a cup. Known for its chilled nightlife, in Valladolid you can go out until four or five in the morning. Right off of Plaza Mayor are treasures for late-night partyers, including: La Mejillonera for fries, calamari and, of course, mussels, all covered in a lovely picante bravas sauce. The best time of year to visit Valladolid is from the first weekend through to the second weekend of September for the Ferias de Valladolid. All of these fantastic bars and restaurants put stands up outside all around the city center, selling special tapas+wine or beer for 2.50€, all while live music plays, people dance, and fireworks go off. The second Saturday of the Ferias is when Vallisoletanos gather each year to break a Guinness World Record. Last year 5,187 people remained linked by purple handkerchiefs; in 2013, 9,900 people simultaneously threw chefs’ hats in the air; and in 2012, 14,922 people kept beach balls in the air at the same time. Probably the most exciting part though is that during the entire ferias, you can see the local Groundskeeper Willie Club celebrating en masse, all in kilts and ginger wigs. While Valladolid is a totally awesome place to party, it’s also really important to Spanish history. In fact, it was the capital when the sun didn’t set on the Spanish Empire, with Isabel, Ferdinand and Columbus ruling and exploring the world. It was also home of Cervantes and playwright Jose Zorilla, as well as the more modern novelist Miguel Delibes. It boasts possibly the most important Easter procession in all of Spain, with the enormous and intricate Stations of the Cross resting on the shoulders of thousands of men, walking through the city’s eerily silent streets. Valladolid is also known as having the most perfect Spanish accent in the world, making a great place for wannabe bilingual guiris. 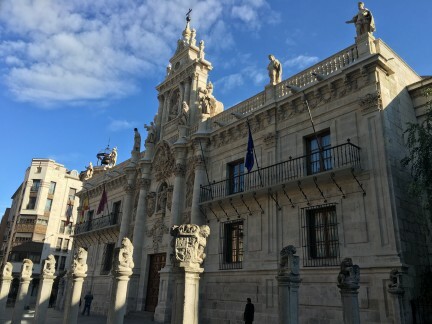 Valladolid may be one of the most underrated cities in Spain, particularly by other Spaniards, but it has a fantastic quality of life whether you are coming for a day-trip from Madrid or staying to cool off throughout summer. It’s a beautiful and easily walkable town, filled with history, culture and simple deliciousness. Who knows, once you’ve visited it, you might want to make it your adoptive town too.